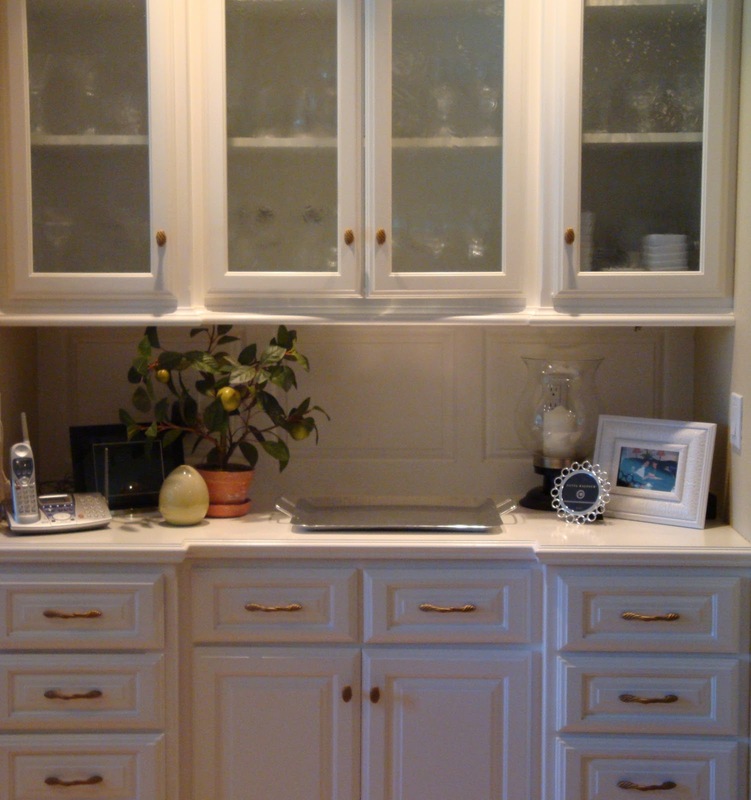 One of the things I did before I left my out of town client's house last month, was to go around and freshen up their accessories, adding to and moving things around where needed. (If you missed the post on styling their bookshelves you can see that here.) Their living room was not bad but there were a few things that needed adjusting. I added a new pillow on the living room sofa (less matchy-matchy) and brought in a little lavender with some flowers and candles. Oops! I moved the chair to measure for the area rug and didn't put it back before shooting the photo! I changed the coffee table a bit and removed a more modern glass bowl that the client was not happy with on the table (something I had previously placed) and replaced it with an opaque white, more sculptural bowl. 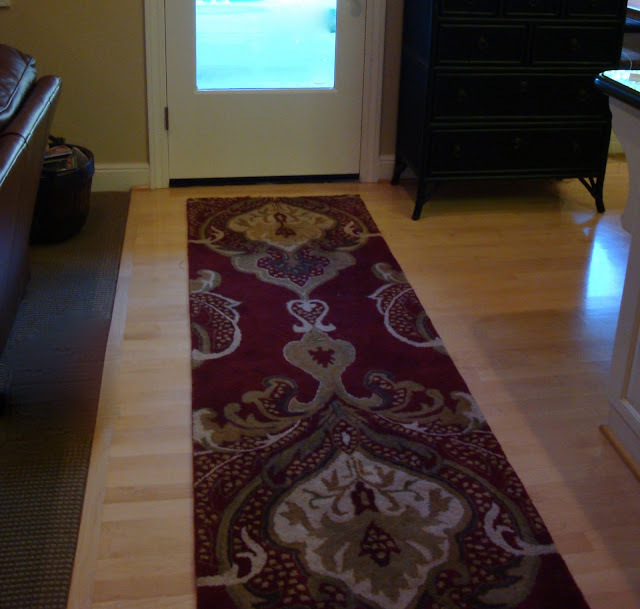 The carpet shown in the photo has been replaced. We purchased a beautiful and inexpensive remnant that was cut to size and surged and is now in place. The walls are being re-painted to a more grayed down tan (Benjamin Moore Glacial Till AF - 390) and two small ottomans were purchased and will be placed in the bay window (not shown). I am waiting for photos! I changed the frames from black to white and silver, added a tray and a pretty plant to hide the phone cords. Their family room (besides the bookshelves needing rearranging) was pretty well finished. I added a couple of new pillows to freshen it up and also a fun owl from ZGallerie to bring in a little brightness (the white) and some whimsey. Owls have been something they have been fond of since they found one nesting in their tree when they first moved in and so it is also makes it personal. And one of my favorite improvements was the back door area. My client had emailed a list of 'issues' that she wanted my help with before I came up. One was the back door area. 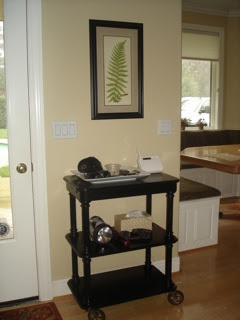 On my previous visit I had place a cart that had originally been in their dining room (previous house). It was meant to be a place to drop their keys and maybe a wallet and glasses when you came in the door. I had placed a white ceramic platter on top to contain what was dropped there. But it ended up being a catch all for too many things. She also wanted to know if there was a way to conceal the very large flashlights that needed to be accessible to the back door. I brought in a dresser that had been purchased for their previous home and was currently being stored in their home office. 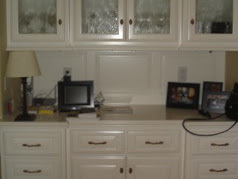 The flashlight and larger items can go inside the drawers; still conveniently within reach but out of sight. I also replaced the smaller 4'x6' area rug and put in a runner from Cost Plus World Market, and hung a new piece of art above the dresser. My philosophy when decorating is that less is more. To keep a space from feeling cluttered I use larger pieces and less of them. One or two really nice frames can be better than 5 smaller ones. One of the things I tell clients is, "when you are out looking for something to buy, think larger and less." And also to buy what you really, really love. When I see something that I really love, I will buy it even if I am not sure where it will go. Because I love it, I will make it work somewhere. Tomorrow I will show you more of what we accomplished in the week I was up there and some fun fabrics I found! Nice post. And, I love the runner. Sherri, that runner is perfect! Thanks for all the tips! I love the back door area. I agree with you about statement pieces versus lots of little items. Nice job. Great post, Sherri! I love all of your touches, esp. the pillows. Wow, this looks great :) I love that shade of blue in the living room -- you must be totally proud of this job. I read every word and studied every picture. 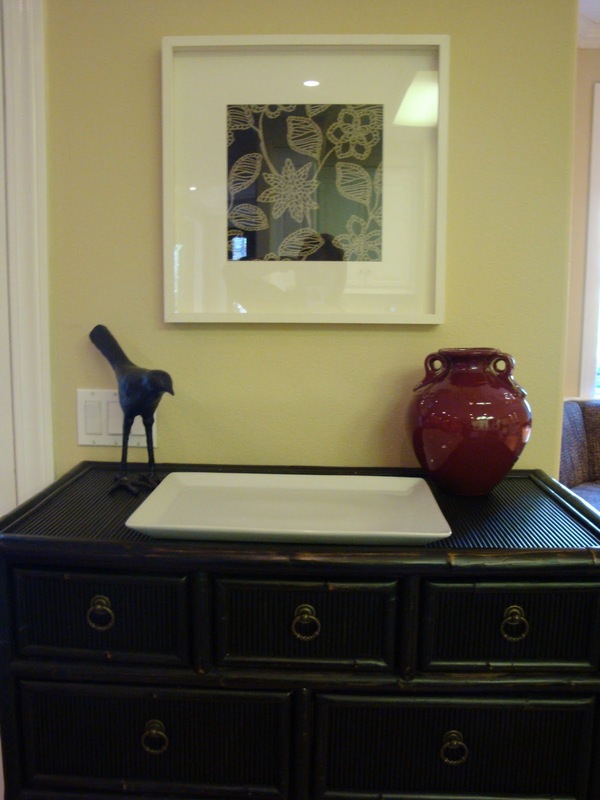 I love the two prints in the hall above the black chest, too. You are GOOD, my friend, I'm glad I found you! Boy...you really "cleaned" that place up! Just the little touches made so much difference!